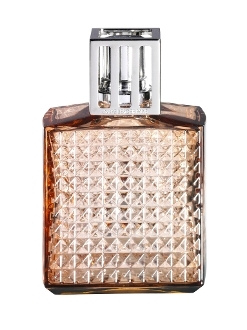 Lampe Berger's Diamont Amber is a crystal art deco lamp that captures the light in its many facets. The diamond shaped contours are trendy fitting into many decors. Designed by Tous Les Trois Design group, this is an interesting unusual lamp. It is supplied in a nice gift box with all the accessories: instructions, funnel, burner and both tops.